Welcome to June's newsletter. Our favourite this month, and a piece that I would truly love to keep is this Wedgwood Fairyland Lustre Daventry design bowl. Dating from the mid-1920s and designed by Daisy Makeig-Jones, this is simply a beautiful and luxurious piece, full of fine detail and rich colour. Daisy Makeig-Jones was something of a character - daughter of a Rotherham doctor and student at the Torquay School of Art, she spent a spell studying in London and in 1909 managed to get an introduction to Cecil Wedgwood. Persistence and persuasion meant that not long after she started work in the Wedgwood factory as a trainee designer. Her talent soon became evident, and in 1914 she was given her own studio. By luck or design, she became involved in the trials of the new lustre glazes that were being experimented with, and found in them the perfect backdrop for her increasingly imaginative and intricate designs. Once launched, the lustre ranges proved a huge success, with demand outstripping supply. Throughout the 1920s the range went from strength to strength and became more and more fantastic. Designs featuring fairies, elves, pixies and other mythologically inspired images sold strongly. As the 1920s came to an end however, the depression of the 30s started to bite, and a new chairman took the helm at Wedgwood. He was not so enamoured of the lustre range, and sensed that the public's affection for it was also waning, as the Art Nouveau style designs started to look a little passe alongside the new Art Deco-inspired lustre wares being produced by some potteries. Daisy herself had also become a little too much of a handful, and in 1931 she was asked to leave the company, which she did with the greatest of reluctance. Today, Fairyland lustre is amongst the most desirable and expensive of early 20th century lustre wares, and is correspondingly scarce. From the output of one studio to another, the next piece I would like to share with you is this understated and stylish smooth-glazed Troika vase. Troika has gained quite a high profile over the last couple of years, with prices rising quite spectacularly. We deal in quite a lot of Troika, and over the last few months have started to notice a definite maturing of the market for Troika. Rarer, more unusual pieces seem to attract more interest, and people are perhaps a little more sensitive to subtle details in pattern and colouration. All this has to be a good thing for the future of Troika as a collectable, and this vase is a nice example of a piece of smooth glazed Troika. 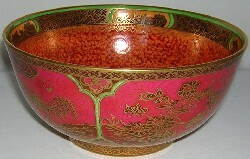 As well as their better known textured range, Troika also produced a range of glazed wares, of which this is an example. Troika founders Benny Sirota and Leslie Illsley were always said to prefer these glazed wares themselves, but they were harder to successfully fire, leading to lower volume and higher costs, meaning that they are much scarcer than textured pieces today. The pieces were mostly glazed in either white, blue or black, with much subtler decoration. Most collectors seem to like one range or the other, but not both! The final studio visit of this newsletter is to one which has sadly left these shores, a victim of outsourcing and cheaper foreign labour. Pendelfin was established near Burnley in the 1950s and over the next 50 years produced a memorable range of stoneware rabbits, many designed by founder Jean Walmsley Heap and all decorated by hand and modelled with an eye to humour and storytelling. Whilst they are still being produced, the main collecting interest is now in the older rabbits, of which we have a good selection, my wife being an avid collector herself! 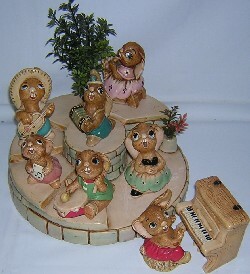 Pictured here is an original Pendelfin Bandstand, along with a selection of musical characters on its steps. This Bandstand is the original version, produced from 1964-73, not the later remodelled version, which is still in production. Our only fair this month is Antiques In The Park at Kedleston Hall near Derby. More details can be found on Jaguar Fair's website. As usual our Fairs Page will be kept up to date with future fairs. As always, click on any of the pictures to see more, and please don't hesitate to contact us with any questions or requests.